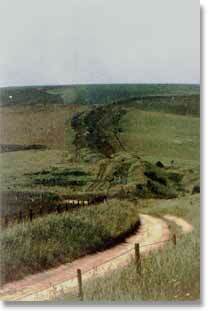 My first visit to Wansdyke went by almost completely unnoticed, as I was not familiar with the territory. The second one fared hardly any better, for there was nothing to be seen from the road. The third time I came prepared. My wife and I (we got married in the meantime) came by car (no more bikes!) and stayed for the week at the Old Rectory in lovely All Cannings. 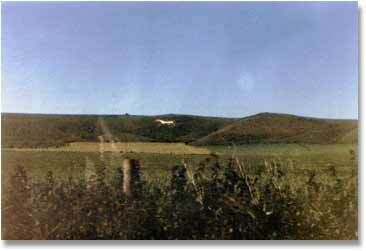 This small sleepy village lies just south of the ridge of the Downs in the Vale of Pewsey, right on the doorstep of Wansdyke, so to speak. We had visited Glastonbury for the second time the other day, so it was time to stretch the legs and go where I had planned to go: Wansdyke. We parked our car on the little parking lot so often used by hangglider-enthousiasts, and went for our few miles (4,5 km) walk. The track crosses a few fields and joins the old Ridgeway halfway up the slope, which turns towards a small gap. Though seemingly just a short walk, the high winds and temperatures made it somewhat more than a stroll. The views made quite up for that though. 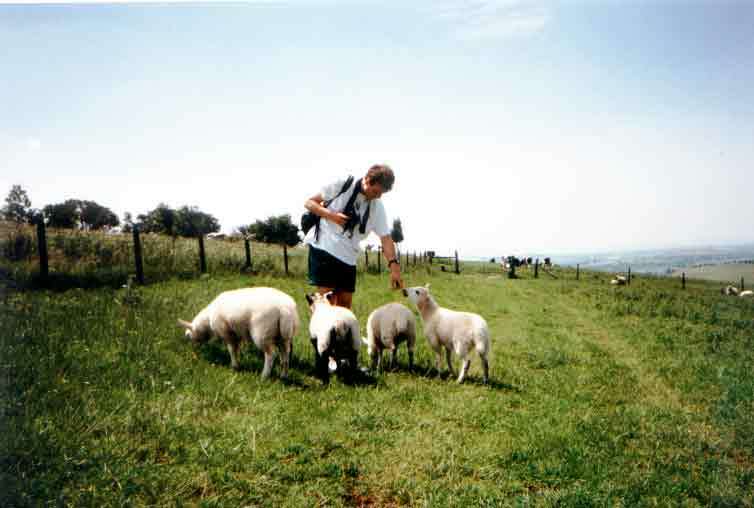 First, on leaving the carpark at the old 'Workway Drove', the path follows a comb out of the Vale of Pewsey, sweeping gently up the hillside with the Vale of Pewsey in the distance. At some Point, the Great Ridgeway sweeps off to the right, crossing the Dyke in the woods on its way to Avebury. When you follow the fenceline, the track passes an ancient enclosure, probably Iron Age, known as the Eald Burgh, the 'Old Fort'. 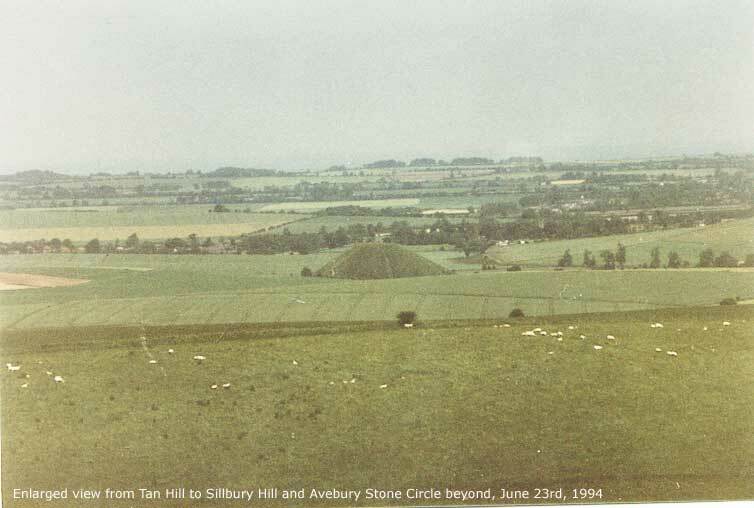 The view to the south-east now shows Knap Hill, Walker's Hill and Adam's Grave, all showing signs of early occupation. 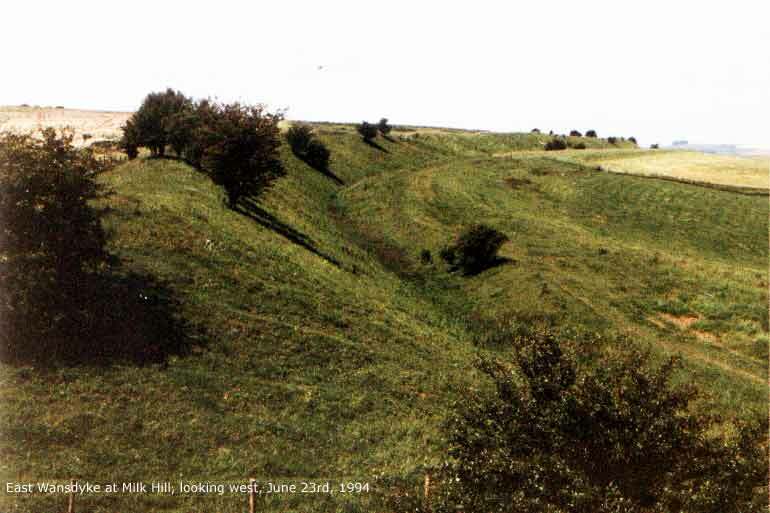 Then a great earthwork appeared at the horizon - Wansdyke! 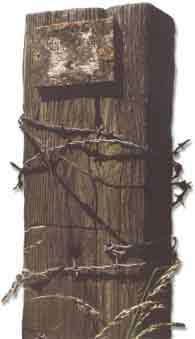 (above, click here to enlarge). 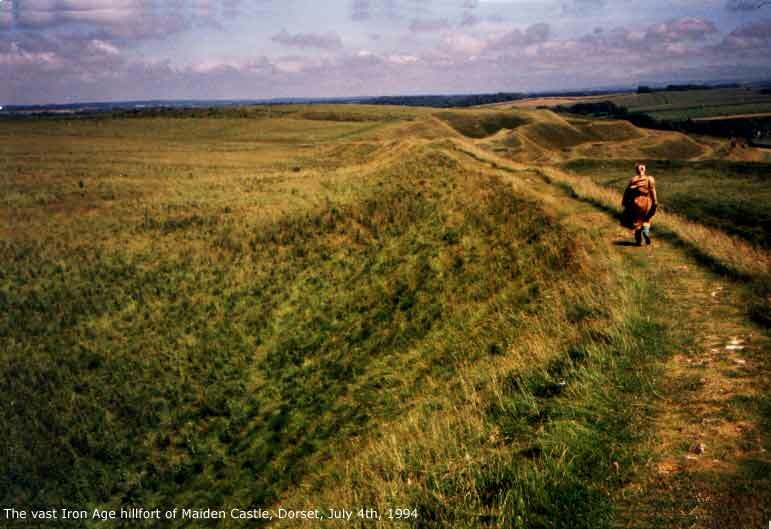 This is Wansdyke at a 'shore', one of the few original openings known (there are lots more of them these days, but they're made for the cattle and stuff). A nd then..the view! We could see from the woods in the east, right across the Kenneth Vale in the north with Silllbury Hill (left and right, click here and here to enlarge) very visible in the middle. 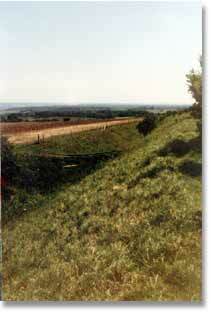 Wansdyke looks really massive here, with a deep ditch in front of it. Small wonder this is looked at as very different from the western part of Wansdyke, which is ploughed down along large parts of its course. But luckily, the Marlborough Downs have never come under the plough due to their chalky geology, which is why this monument continues to be close to as impressive as it once was, as you can see from this picture (click here to enlarge). its course, following the curve of the escarpment, is a deep scar in the landscape. 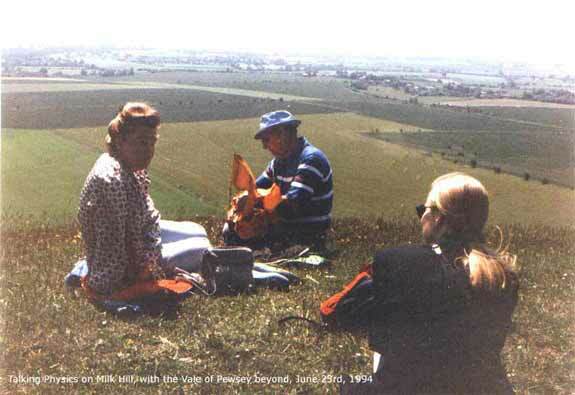 Of course, this is a visit to Wansdyke, so something had to go wrong, I know you're just waiting for it. Well, it did, twice in fact. My wife has always been sensitive to hayfever, and that day the pollen count went sky-high. You know, fabulous weather, no wind, a flower reserve close by...and only one hanky. You can imagine the results. At that point, after about 500 metres along the top of the dyke, the track veers to the left. This is Milk Hill, and descending along it you can see the villages in the Vale before you. We finished our walk in beautiful beautiful weather, and managed to find the White Horse we'd seen so many times from the valley floor. The Horse (1812) is quite large (click here to enlarge), and much better recognizable from a short distance. This in contrast to the Uffington White Horse, which is much more ancient and quite vague when you're standing next to it... We completed the round trip to Adam's Grave (once Wodensbeorgh, 'Woden's Barrow') in a blistering heat of at least 27 degrees centigrade, but we met some nice people on the way. The girls managed a lively discussion (left, click here to enlarge) about the Big Bang and the nature of Light - Philippine has a PhD in Physics, while he showed me a strange kind of kite (right), which turned out to be a WW2 distress gadget for the radio arials of downed pilots.. I forgot to take down their names properly, so if anyone knows them, please mail me! We also managed to visit Avebury that afternoon, but it was hot and the pollen still managed to lessen the joy of revisiting that great site. 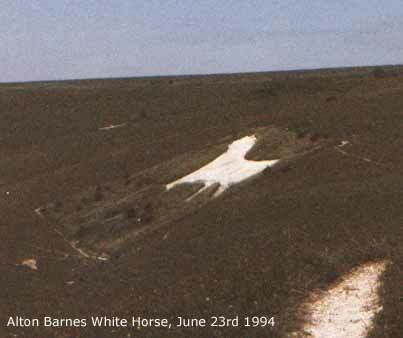 On the way home, we again saw the White Horese, gleaming brightly in the late afternoon sun agains the dark hills. Brilliant. The other thing we noticed only two weeks later, when we had arrived back home and had our pics developed. 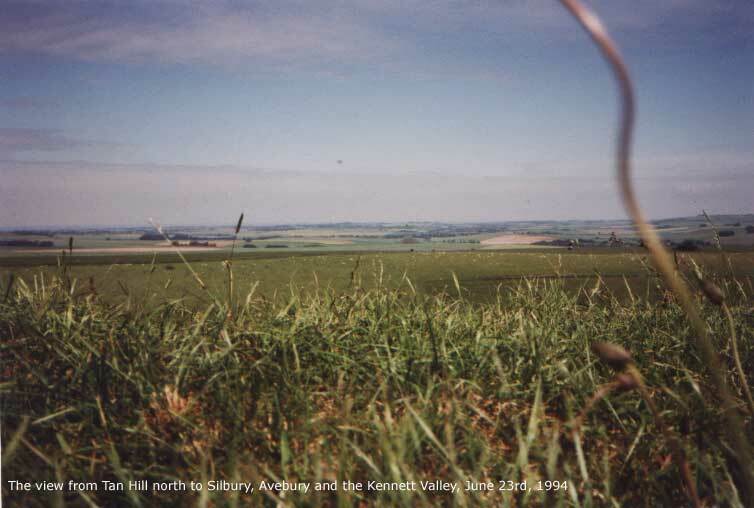 It seemed I had somehow managed to adjust the camera to 400 ASA, with only a 100 ASA film inside.. That's why there are only a few decent pictures of the Wansdyke trip, and I did not shoot them! Although I was quite mad at myself for such stupidity (we lost a week's pictures, something I wouldn't wish on anyone). 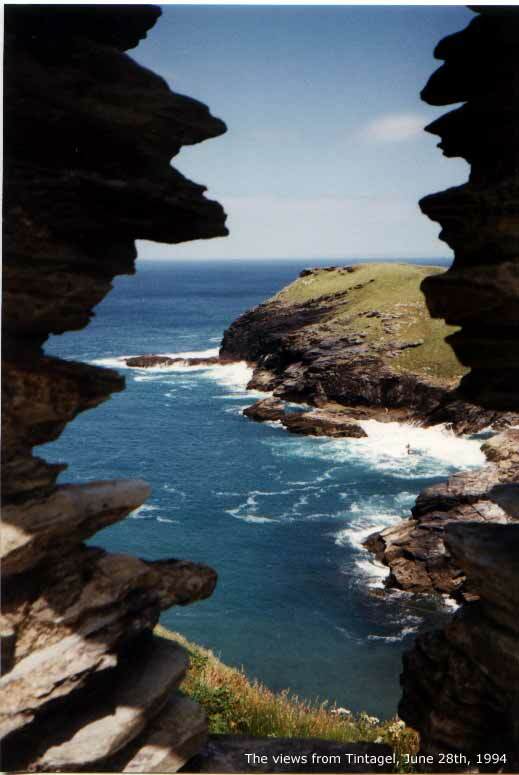 But even better than the many Arthurian sights in thgis western tip of Britain are the views.. Endless waves (click here to enlarge) seen across lush green hills - we could not get enough of it! 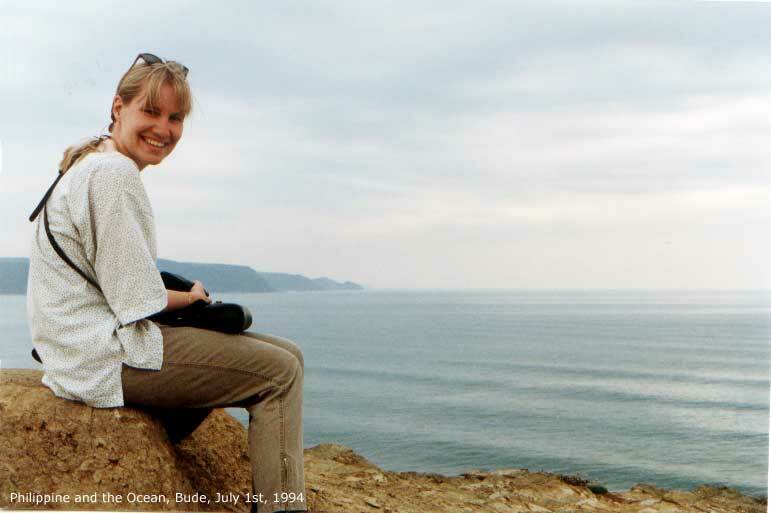 The last week we spent in Sutton Waldron (Dorset), visiting more Arthurian sites and other very beautiful spots. One such was the 155ft. high Cerne Abbas Giant (click here to enlarge), cut out into the turf high above a beautiful little valley. This may represent Hercules, but naughtier ideas have been put forward.. Another was Maiden Castle (click here to enlarge), the largest iron Age hillfort of Britain, and surely the strongest! However, these triple banks could not withstand the Roman onslaught. Neither could its neighbour, Badbury Rings (click here to enlarge), but at least this hillfort-in-name-only continued as a settlement (called Vindocladia), mainly because two Roman roads cross here. 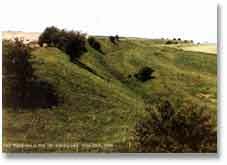 Badbury, I fear mainly because of the name, is a major candidate for the famous, yet elusive Arthurian battle of Badon Hill. However, even though the views are breathtaking, I would not immediately call it a 'hill'. Very Arthurian is also South Cadbury! At this very imposing and beautiful hillfort (click here to enlarge), a major post-Roman restructuring of the defences was detected, and with Arthurian connections in place for centuries..was this Camelot? Come and see for yourself, as I've done twice by now (it never gets boring). Climb up to Artur's Palace, see the Arthurian gate, or get chased by Arthur's Cattle..
As you can see, the pictures were fine, thank goodness! All the more shame we lost those of Wansdyke (although now, seven years later, I marvel at what can be salvaged by using the combination of a reasonably good scanner and even better imaging software...). I made a vow to return: we'd have to come back some time to shoot those again. 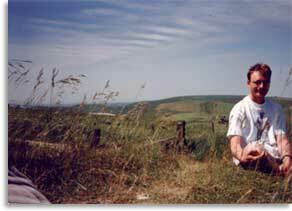 We would, visiting both West and East Wansdyke, two years later. 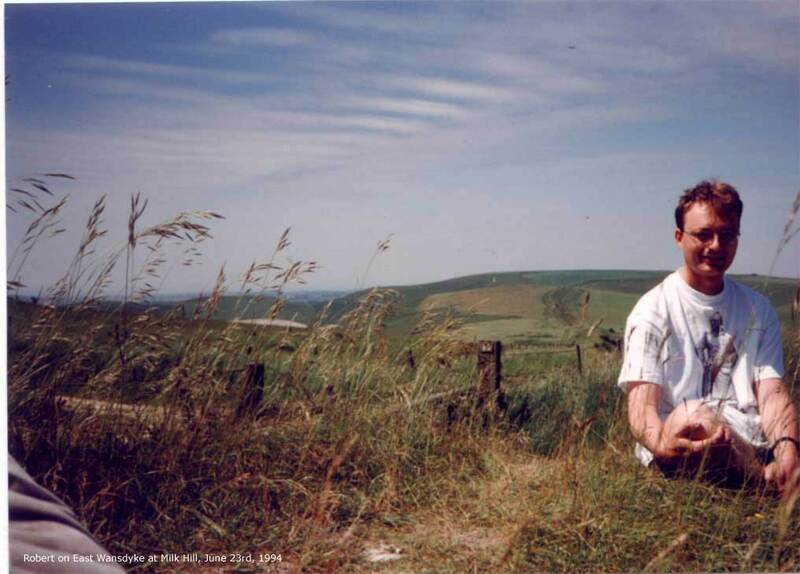 VortigernStudies and Wansdyke Project 21 are copyright � Robert Vermaat 1999-2007..